The primary goal for the Federal Reserve is to maintain a healthy financial system that allows for sustainable trend economic growth with moderate inflation (the goal is 2% or less for the price deflator for consumer expenditures less food and energy). Unfortunately, the Fed no longer has a good operating guide such as growth in the monetary aggregates because they no longer know how to define the money supply for transaction purposes. Instead, the Federal Reserve Operating Committee (FOMC) has to rely on historic relationships between inflation and “sustainable” trend economic growth (which is a tricky concept to nail down). The general belief has been that inflation accelerates with wage pressures after unemployment drops below 4%. The FOMC believes that trend growth for the U.S. economy is currently near 2% given the recent developments in productivity and the expected growth in the labor force. The focus of this Spotlight is an issue that will become very important to housing starts and wood products markets: the large and sustained budget deficits over the next seven years. There is no question that the business community is pleased with the lower tax as seen by the surge in small business optimism. Unfortunately, what might feel good in the short run (higher after-tax cash flow) could have some negative long-term consequences. First, the tax cuts are doing exactly what was hoped: they have boosted the quarterly economic growth rate. GDP growth last quarter exceeded 4% for the first time since 2014 and will likely approach that rate in 2018Q3 as well. This is adding fuel to an already hot labor market, where wage rates are now increasing at a 2.7% annual rate and will accelerate if economic growth stays above 3%. Second, the Fed is now likely to boost interest rates two more times this year and at least four times next year. The FOMC could be forced to be even more aggressive next year if inflation and growth are significantly above their targets mentioned above. The Congressional Budget Office (CBO) is assuming the long-term treasury bond rate will go up only 1% from current levels. There are a variety of factors, including domestic credit demand, domestic savings rate and foreign capital flows for instance. There is a risk that the sustained high borrowing levels by the federal government combined with other Fed actions will put even more upward pressure on long term interest rates. I return to this point again later. The budget deficit forecast that I will be using is generated by the CBO. The CBO puts together the most credible projections of the Federal Government Revenue, Spending and Deficits. Their view was issued in April 2018. The outlook for government revenue, spending and deficits is based on the Administration’s tax cut and budget proposals. 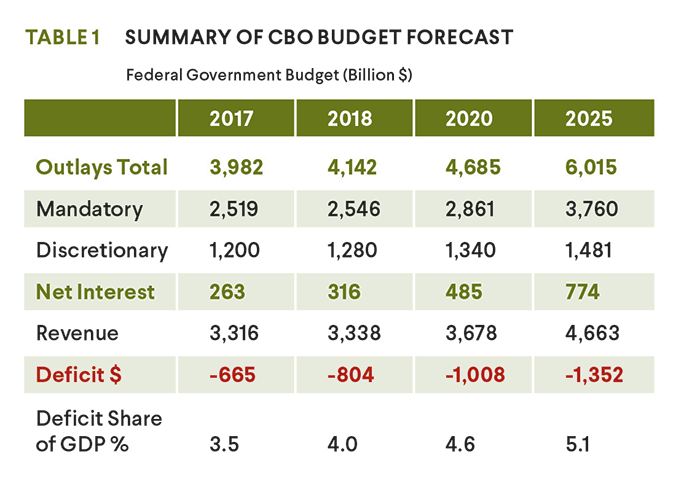 This budget forecast requires the CBO to develop forecasts of the economy. The CBO uses the Census forecasts for population and labor force growth. The CBO’s estimates of economic growth and interest rates are more conservative than the Administration and are closer to the Blue Chip Consensus forecast. Their interest rate forecast (which becomes very important, as will see later) is consistent with the current FOMC forecast. Their outlook assumes that interest rates will peak in 2020 and then decline. They also forecast that inflation will not go much above 2%, despite unemployment falling to 3.3% in 2019. 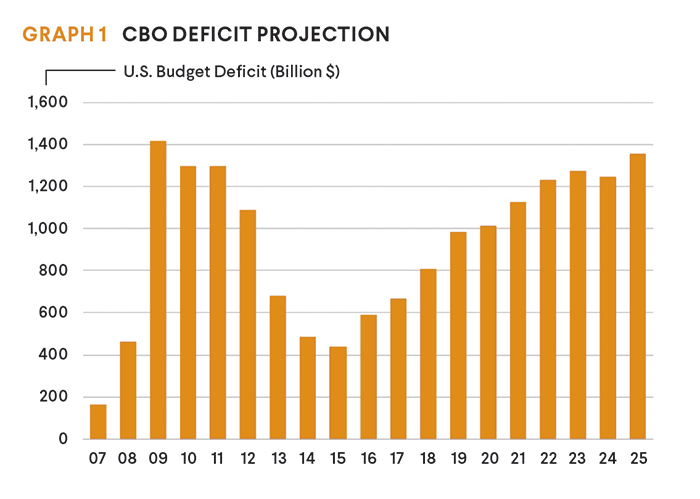 The combination of the tax cuts, plus a pick up in defense spending will push the budget deficit above $1 trillion again in 2020 and stay at that level through 2025. Budget deficits will be above 4% of GDP for 6 years. And the situation would likely get much worse if there is a recession. The CBO does note that a recession is a major risk, since this economic recovery is now nine years old—very long by historic standards. Now, let’s consider how challenging it is going to be to reduce the budget deficit—that is, if someone in Washington D.C. ever thinks it is a problem. To understand the challenge facing future policy makers, the key elements of the U.S. budget are summarized in TABLE 1. For simplification, the budget is broken into three major categories: Mandatory, Discretionary and Net Interest. First, the biggest bucket is Mandatory spending. This category currently composes 63% of the budget and is still expected to be 62% in 2025. This is a tough category to cut, because about 70% is for Social Security, Medicare and Veteran’s programs. Cutting these programs is very risky politically. Spending on these categories will rise at the same rate as real GDP because of the aging of the population and rising health care costs. A few categories such as Medicaid and farm support could face modest cuts. The next Budget category Discretionary spending. This is 31% of the 2018 budget. Spending reductions usually focus on this category. The share of Discretionary spending is forecast to decline to 25% of the Budget by 2025. Defense spending is about 50% of the discretionary budget. Under the current proposal, defense spending grows about the same rate as non-defense. Clearly, this will be the battleground between Democrats and Republicans over the next seven years. Finally, we come to the last category: Net Interest payments. This will be the fastest growing category. Net Interest is expected to grow from $263 billion to about $800 billion by 2025. As a share of overall expenditures, Net Interest will rise from 7.5% of the budget this year to 13% of the budget in 2025. Two factors are driving the dramatic growth. First the high budget deficits lead to a dramatic growth in the outstanding debt of the U.S. Government as shown in GRAPH 2. Second, higher interest rates will increase the annual payments. Currently, the weighted average for the interest rate on outstanding U.S. debt instruments is only 2.3% for a debt load of $14 trillion. CBO estimates the outstanding debt will rise to $24.5 trillion by 2025. The average weighted interest payment rises modestly to 3.5% by 2025. That is partially due to the average maturity of the outstanding debt, which is about five years. There is a lag to rising rates. But also, the interest rate forecast might prove to be optimistic. For instance, if interest rates move 1% higher than forecast by 2021 and stay higher, this would add $250 billion to the annual debt servicing by 2025. The large deficits and growing debt level will create serious policy challenges in Washington D.C. 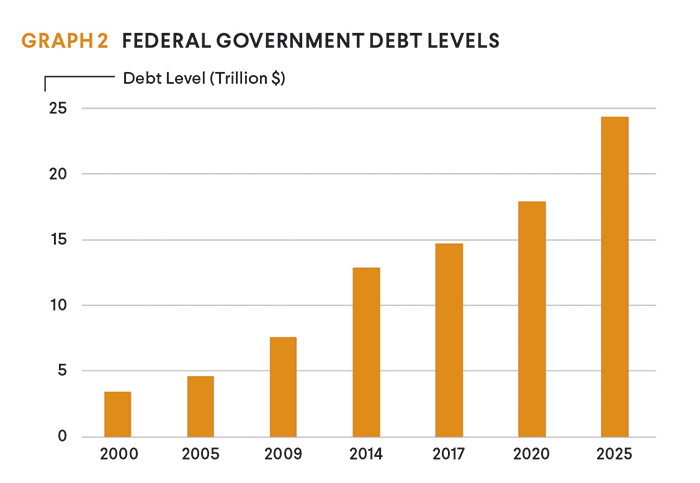 The outstanding debt load of the Federal Government will approach 100% of GDP by 2025, levels not seen since the end of World War II. As mentioned, there are not easy options to deal with this Beast. The biggest nut that has attracted attention has been Social Security and Medicare for some conservative congressmen. The approach to these programs will be very different for Democrats and Republicans, and could have huge implications for which party rules. Raising taxes is another option. The Trump Tax cuts were not supported by Democrats and will be their target if they gain control of the Executive and Legislative majority in 2020. With the Federal Government set to borrow $1 trillion per year and the Fed ready to sell off $400 billion in longterm assets per year to reverse the stimulus of Quantitative Easing after 2008, long-term interest rates could move higher than expected in most forecasts. The CBO forecast for instance could be optimistic on interest rates. Finally, and potentially the biggest concern: What is the government going to do if the U.S. economy does fall into recession? A recession will cause the deficit to rise even higher. With deficits already high, the government will not be able to pursue aggressive policy such as tax cuts or domestic spending programs to stimulate the economy. Bottom Line: Although the recent tax cut has boosted economic growth and corporate profits, the actions may have a variety of long-term consequences. The large and growing budget deficit could boost interest rates more than currently forecast. Some economists like to argue that increases in the deficit have not led to significantly higher interest rates. The current situation is however very different. Usually, the budget deficit rises as the economy sinks into recession leading to a decline in the demand for credit in the private sector for housing and investment. For instance, in 2010-11 when the Federal borrowing surged to $1.5 trillion per year, private credit demand was declining by about $400 billion per year. This deficit is rising with an economy near full employment and healthy economic growth. Financing the U.S. government with debt is particularly bad for industries that are interest rate sensitive. The large and growing deficits are a major problem for the U.S. housing industry and, in turn, wood products and timber businesses. Even with the CBO forecast, mortgage rates will move from 4.5% in 2018 to near 6% by 2020. What if they push above 7%?